Icon showing your contribution to the project, for being placed on a web page, blog and on the social networks, with a link to the project page. Animated GIF referential to the project, for being placed on a web page, blog and on the social networks that allow animated GIFS. Is accompanied by the precedent reward. 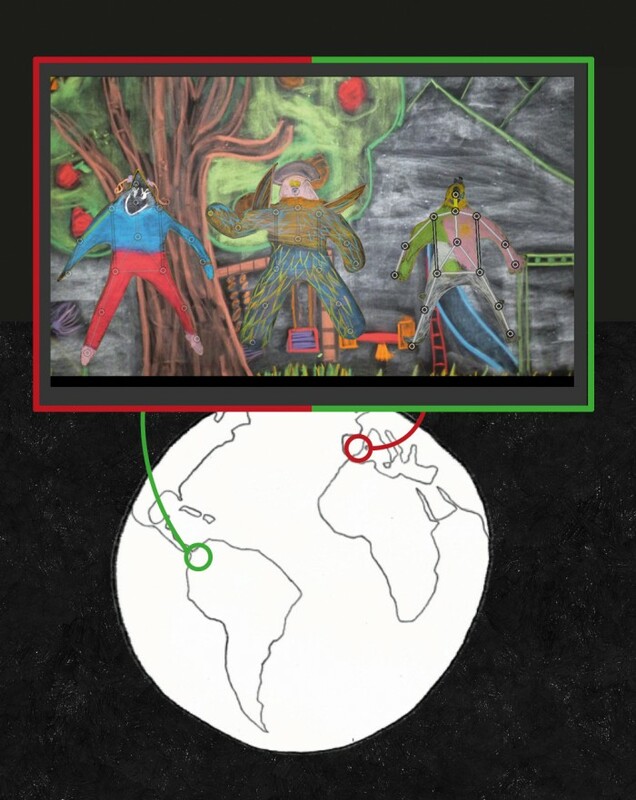 Virtual image for downloading that will be one of the images created by the kids in the pilot project, with an special knowledge for the collaboration. Is accompanied by the precedent rewards. Set of images with graphical content derived of the results of the pilot experience, to be used as screen-savers. Are accompanied by the precedent rewards. Video edited with documentary footage of the pilot experience with a personalized dedicatory and an inclusion in the credits as a contributor. Is accompanied by the precedent rewards. Directory of school centers and associations interested in the project as participants. Spreading a directory of school centers or associations interested on collaborating, helping in keeping contact between potential partners. Is accompanied by the precedent rewards. Updated Directory of school centers and associations interested in the project as participants. This directory will be regularly updated during the following year after the final of the campaign. Is accompanied by the precedent rewards. Preferential attention + acknowledge of the support in the web page of the project. Preferential attention for establish contacts, monitoring and developing of an experience with another group. Inclussion of the logo of the association in the webpage of the project. Is accompanied by the precedent rewards. Is included the option that one of the members of the team of OSS could provide the execution of the workshop in the place where it will be done (travel and maintenance not included), participating on the training of the managers of future replications. If this option could not be possible, for the impossibility of paying the travel or maintenace, the attention would consist on the developing of the workshop dynamics along the duration of the first one imparted by the collaborator association or entity. Is accompanied by the precedent rewards. -Realización de material gráfico y audiovisual de presentación y desarrollo de la experiencia, con fines de difusión, documentación y agradecimiento a colaboradores y donantes. -Poner en contacto, hacer seguimiento y relacionar correctamente a los grupos que deseen participar y llevar a cabo un proceso conjunto. Tarea a realizar durante un año. -Realización de material gráfico y audiovisual de presentación y desarrollo de la experiencia, con fines de difusión y documentación. Para permitir un contacto constante y visual entre los grupos sin necesidad de utilizar otros softwares y complicar su utilización, se plantea introducir una plataforma de videoconferencia a tiempo real en la plataforma principal. 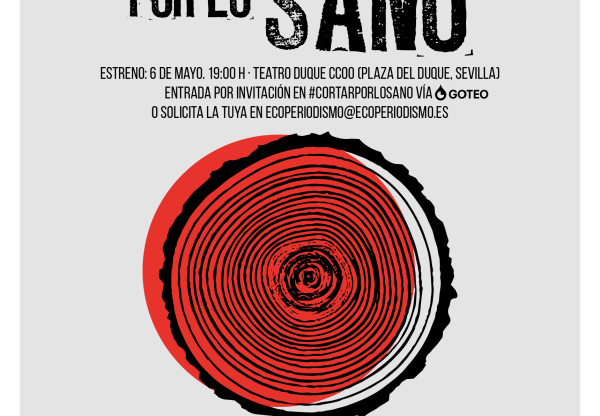 The idea is to create an online platform for the cooperation of two different groups of children and youngsters, each of them situated on different places, allowing them to establish a collaborative process for the construction of a performance. The final stage where they will be able to act will be virtual, set on the internet. One of the main features in this project is found on the quality of the established bond between the two groups along the different phases of the project. Through them, they will be able to brainstorm together, to draw their characters and to generate the plot. Finally, it will be possible that they perform with the characters drawn by themselves, animating them on real time. 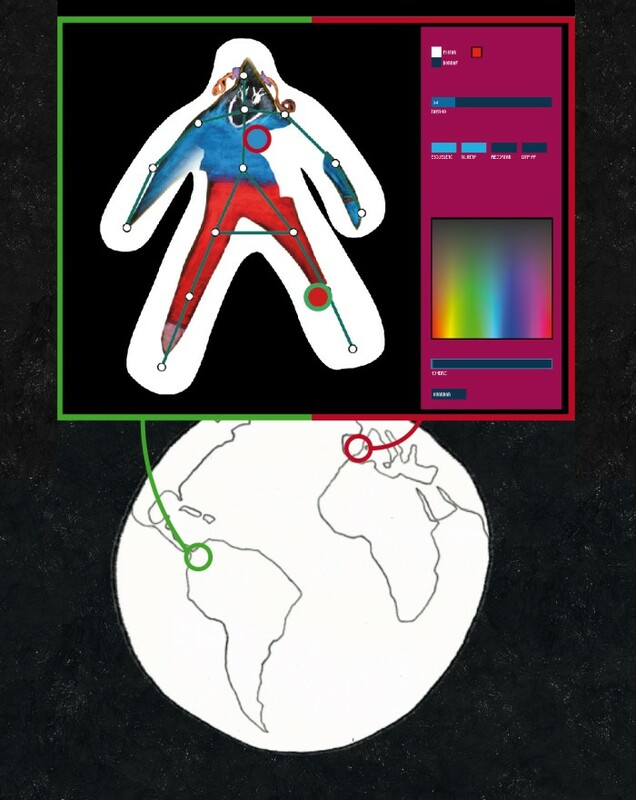 The joint scenario will be virtual, set on the web, but the movements and the attitudes will be captured from the real corporeal expressions of the children, by means of computer vision, and transferred to the characters, bringing them to life. Description of the project. Main features, strengths and differentials. 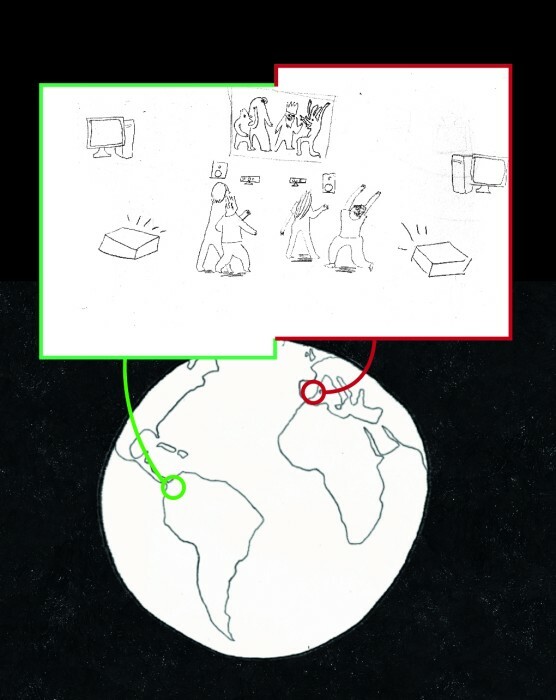 The workshop proposal was the following: after drawing creative representations of themselves and their surroundings (in graffiti format), and through a computerized process, those images were associated on real time to the movements of their drawers. On small groups, they generated a tale and they performed it, in a theatrical way. With this new project we want to join on a similar process two groups of kids that would be placed on different spaces, exploring and developing not usual dynamics of interaction at a distance. Each one of the groups would have their own analysis camera and the kids would perform simultaneously on the both sides. Their characters would meet themselves on the internet, on the specially created platform. Is pretended this platform to be the place for the different stages of the creative process. With its help, the sense of the distance that is separating both groups will be avoided. Is also pretended that the members of both groups could collaborate together on the generation of ideas, the drawing of characters and backgrounds, the developing of the plot and a final performance, that will be possible to be projected in big size at both extremes. 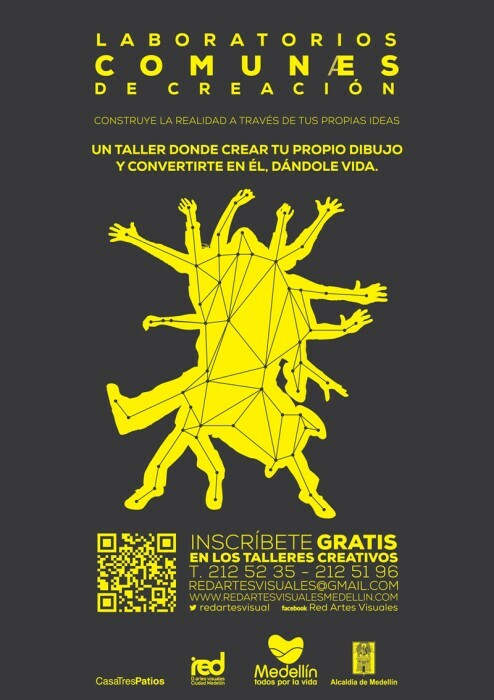 The first pilot experience will take place between kids of the cities of Barcelona, Spain, and Medellín, Colombia. When the platform will be ready, the experience will be able to be lived by any two groups that previously have settled to realize it during the creation period of 4 or 6 sessions. We consider this experience can mean a step forward in the way of understanding the development of educational activities using telepresence as a tool. We are fascinated with the idea of helping building a new understanding of distance and separation, allowing to extend constructive bonds between people that are away both in space and cultural terms. One of the important points of this project is the implication of the body language in an informatic process, accustomed as we are of it being associated to sedentary lifestyle and inactivity. This is the characteristic that will allow to establish the communicative bonds that go beyond being strictly textual and verbal, and it will mean a step forward in the application of embodiment (personification of oneself through virtuality) in pedagogy. First step: Development of a software platform. Contracting of a programmer during a two or three months period for creating the different modules of the application: visual communication interface, database; interface for ensemble drawing and sharing ideas; Animation interface based in an adaptation of the opensource software “Animata”, for being able to run in a server. Most of the money gathered will be used in this step. Second step: Development of a pilot experience between Barcelona and Medellín. In both places a network of cultural institutions with interest on the development of this first experience has been built. Fourth step: Establishing bonds between interested people, setting contacts and developing a program of cultural activities for developing together. Bachelor in fine arts and master in digital arts by the Pompeu Fabra University. He is a transmedia artist specially interested on the development of pedagogic strategies in the ambit of digital interactive art. In 2013 he was selected for developing an artistic project in Medellín, Colombia. Under the format of a workshop for groups of children and youngsters from the different communities of the city, he developed a work that unified plastic art, interactive digital art and performance. The project was called “ I Am my Own Drawing” (www.enricsocias.net/smpd.html). Bachelor in technical engineering and telecommunications (Santander and Lille, France), and master in digital arts by the UPF. He works as a freelance in photography, creative programming and interactive contents designer. He eventually collaborates with the Barcelona Media Foundation in consulting tasks of hardware for physical interactive systems. He also involves himself in new technologies-related art projects: Together with Ani Puihing and Roc Parés, they won the award “Incentives for the production” in the ART AND ARTIFICIAL LIFE international contest, VIDA 13.2, promoted by the Telefónica Foundation, in 2012. 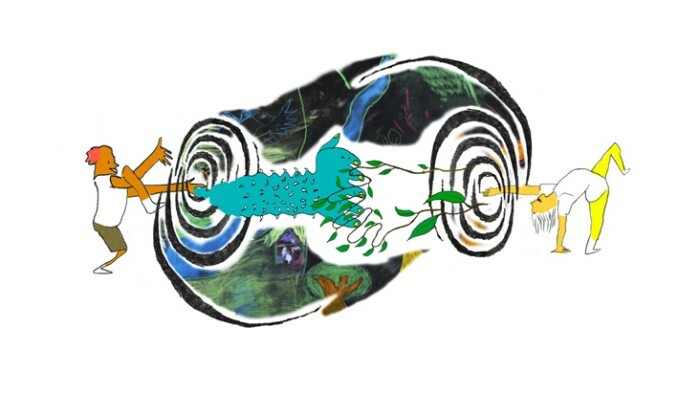 Casa Tres Patios is a non-profit organization based in Medellin, Colombia, which acts as a platform for contemporary art practices and promotes cultural exchange and inter-disciplinary. Experimentation and critical thinking are the main axes around which we perform and promote artist residencies, exhibitions, conferences, workshops, seminars and cultural exchanges, in order to build autonomous spaces for research, teaching and practice of knowledge. These activities are focused on responding to needs arising from the contemporary art world, local and global. MediaEstruch is the researching program for the technological innovation l’Estruch, Fabric of Creation and Live Arts of Sabadell. MediaEstruch is a laboratory for the investigation, development and innovation of TIC applied to Live Arts and a focus of cultural entrepreneurship, oriented to the creation of transdisciplinary knowledges and Economic Common Goods promotion..
L’Estruch is a cultural Center placed in Sabadell (Barcelona), that works with the aim of becoming a referent in dance, image and visual arts, as well in catalonia and the rest of Spain, as in the international sphere. The CVC is a non-profit research center with an independent legal status, established in 1995 by the Generalitat de Catalunya and the Universitat Autònoma de Barcelona (UAB). Our mission is to carry out cutting-edge research that has the highest international impact in the field of computer vision. We also promote the transference of knowledge to industry and society. Finally, we strive to prepare and form researchers of the highest European level. Thanks to our good working practices, the CVC has positioned itself as a specialist in the field of computer vision and is considered a reference in the creation of knowledge towards society. El código de la plataforma de software será puesta a disposición pública en código abierto, permitiendo el desarrollo y la utilización pública de ésta. Será colgado en internet un manual de correcto uso y buenas prácticas de la plataforma de software, para gestionarla con mayor eficacia. Compartiendo esta información se facilita una correcta réplica de la experiencia. En este dossier vendría información tal como las estrategias pedagógicas llevadas a cabo para el buen fin de la experiencia. collaboration on the setting up and management of the network of centers or interested associations. On the both sides of the established communication (ex: Barcelona-Medellín) it will be necessary to get quality video and photographic documentation.